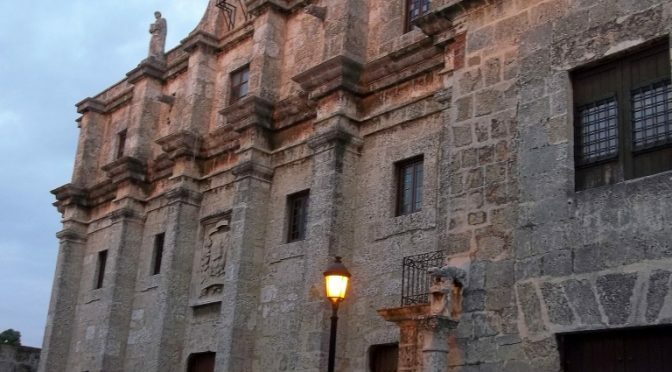 The Panteón Nacional, also know by the names Panteón de la Patria, National Mausoleum or Pantheon of the Homeland, was originally a Jesuit Convent. The National Pantheon is now the mausoleum that houses the remains of many of the national heroes of the Dominican Republic. The Panteón Nacional of Dominican Republic with it’s Neo-Renaissance style. 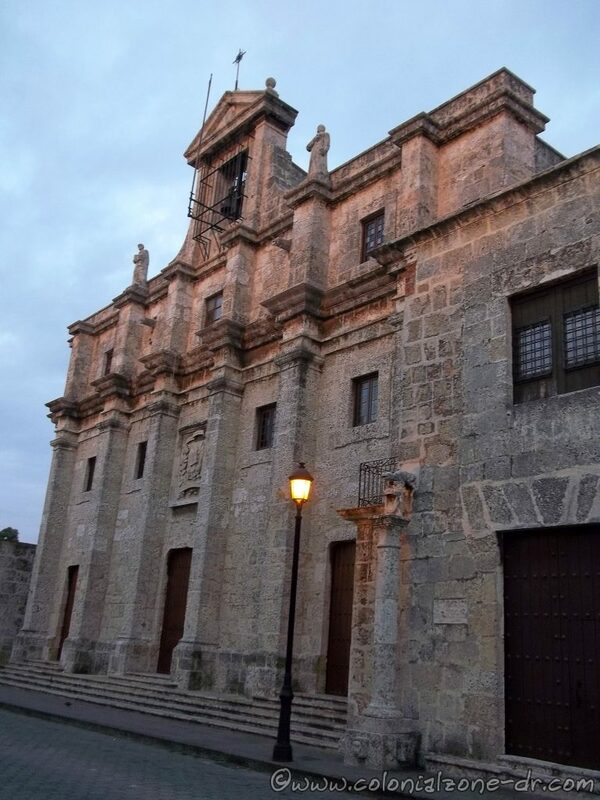 Constructed between 1715 and 1745 this Rococo style building was originally the Jesuits Convent/ Convento de San Igancio de Loyola for the Jesuits. 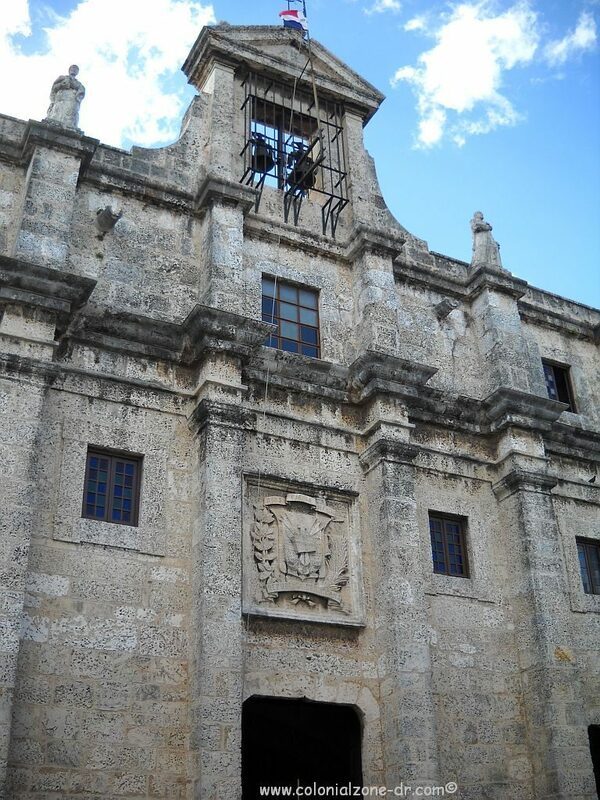 It was the Jesuits home until 1767 when they were expelled from the country. 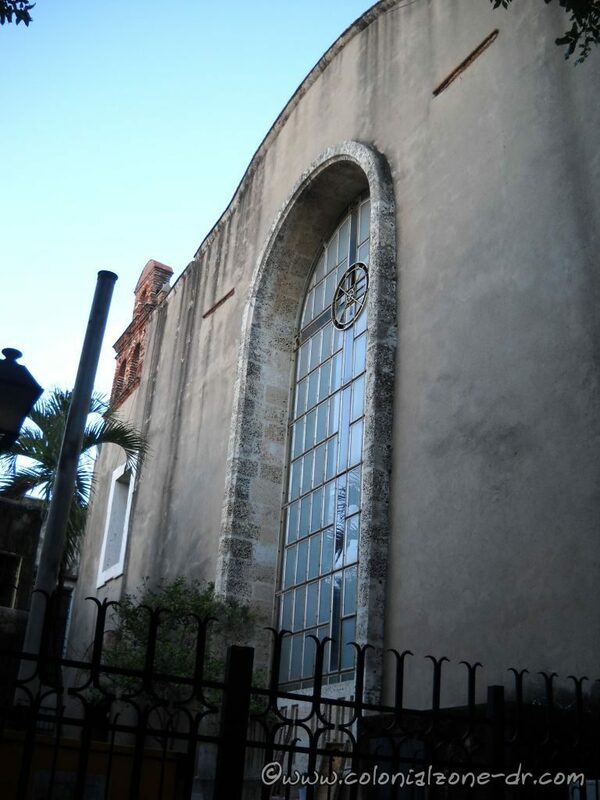 After the church was closed the building was used as a tobacco warehouse, a theater and a government office building. The Panteón Nacional, Dominican Republic. The back window. 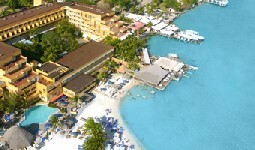 The Dominican Republic dictator Rafael Leonidas Trujillo, in 1958, had the building repaired. Spanish architect Javier Barroso was hired to restore the building so it could be used as Trujillo’s personal mausoleum. Trujillo planned on having his remains interred in the restored building when he died. His dream never happened. In 1961, after his assassination, Trujillo’s body was removed from the country. The building never held his remains. 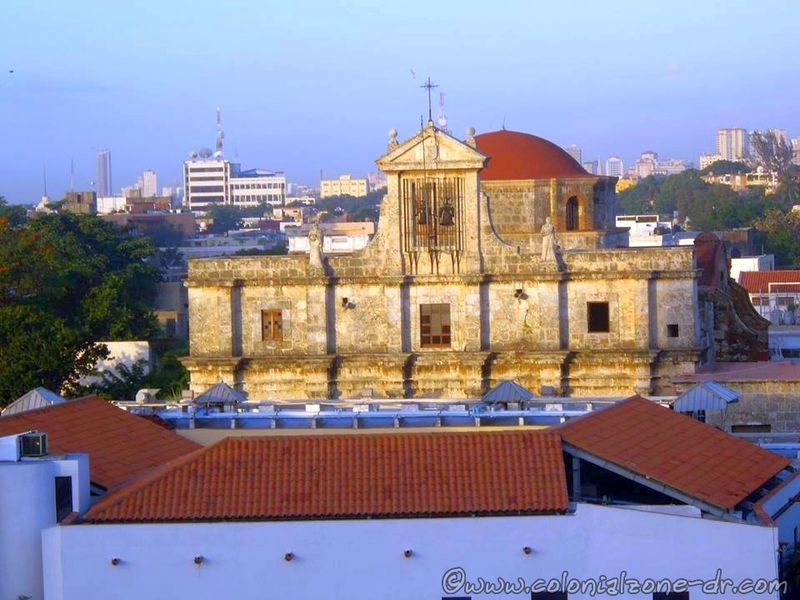 In the 1970’s the old Jesuit Convent was converted into the Panteón Nacional. A national mausoleum where many heroes of the Republic are laid to rest, including Trujillo’s assassins. The architectural style of this majestic looking building is Neo-Renaissance. The facade of the building is very impressive with the bell tower and the Dominican Coat of Arms beautifully sculpted above the door. 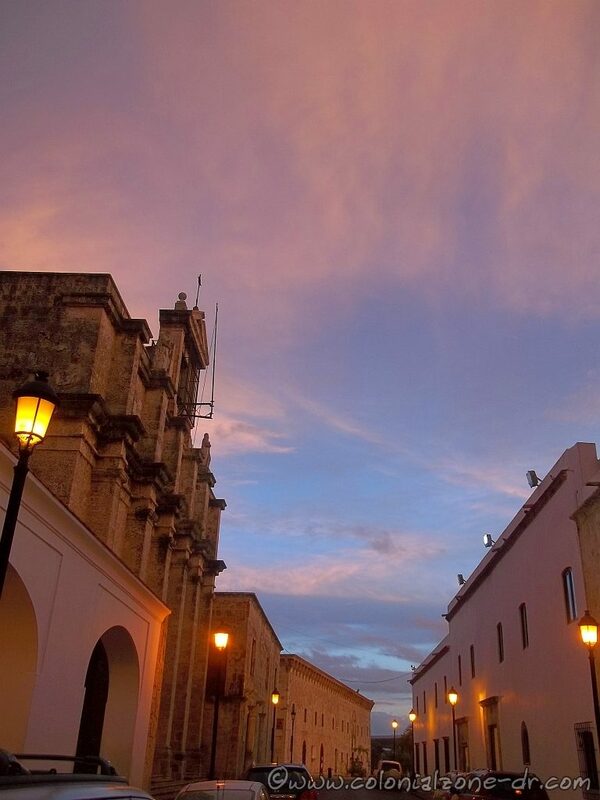 Panteón Nacional, República Dominicana. Front of the building. The interior of the Pantheon has a Baroque style. The red carpet down the center with a guard on duty watching over the persons interred and the eternal flame both provide a very reverent feel when entering the building. The light coming through the large glass window in the rear of the building adds a lovely light to the solemn interior. 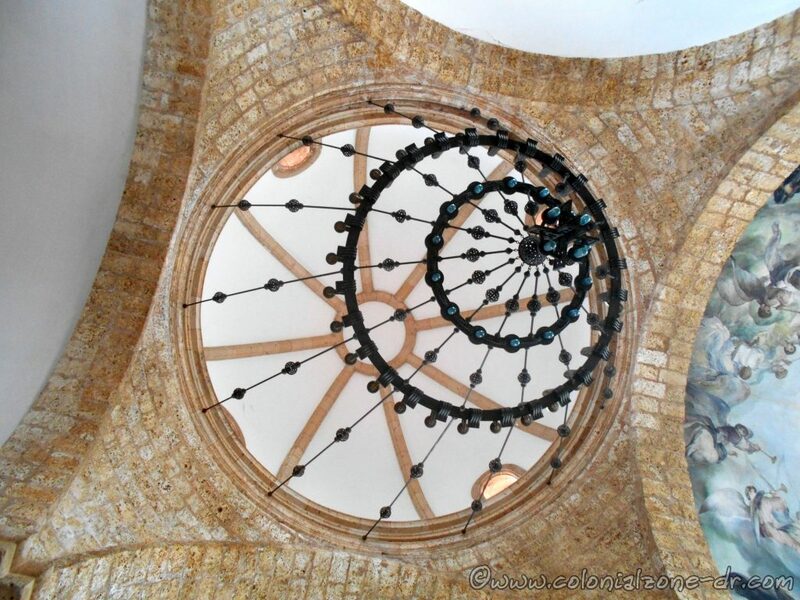 The copper chandelier in the center ceiling of the mausoleum, donated by Francisco Franco (a Spanish head of state), is quite elegant. 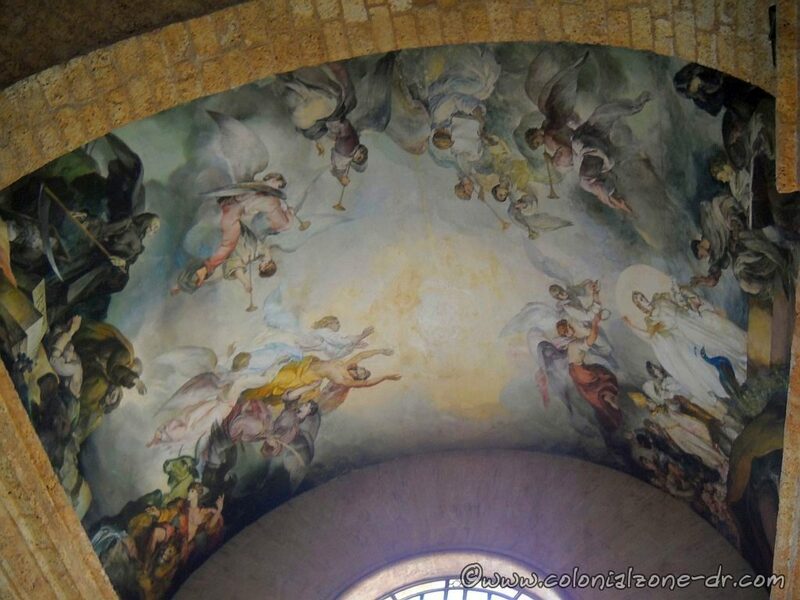 Painted on one of the vaulted ceilings is a stunning mural. This impressive sacred art is called “Ascensión a los Cielos” / “Ascension to Heaven” and “El Juicio Final” / “The Last Judgement” by Spanish painter Rafael Pellicer. 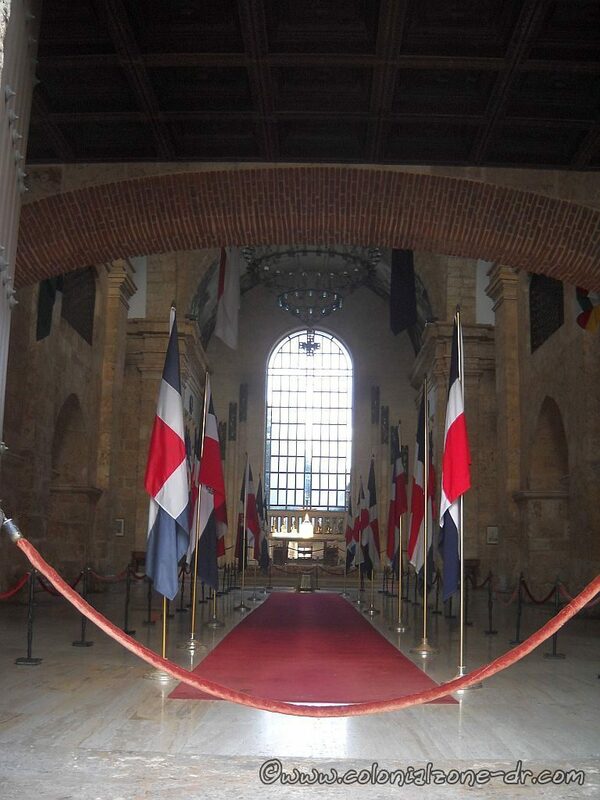 The Panteón Nacional contains the remains of many of the national heroes of Dominican Republic. Independence Heroes (from Spain and Haiti): General Juan Sanchez Ramirez, Jose Nunez de Caceres, Juan Nepomuceno Ravelo, Pedro Alejandrino Pina, Juan Isidro Perez, Felix Maria Ruiz, Maria Trinidad Sanchez, Socorro Sanchez, Balbina de Pena, Admiral Juan Alejandro Acosta, Admiral Juan Bautista Cambiaso, Concepcion Bona, General Jose Joaquin Puello, General Jose Maria Gabral, Gabino Puello, Angel Perdomo, General Pedro Santana. The Panteón Nacional of República as seen from Rio Ozama. Heroes of the Restoration (Independence from Spain): General Gregorio Luperon, General Benito Moncion, General Santiago Rodriguez, General Gaspar Polanco, General Antonio Batista, Colonel Jose Pierre Thomas, Colonel Carlos de Lara, Commander Jose Vidal Pichardo, Ulises Francisco Espaillat, Lieutenant Ambrosio de la Cruz, Eugenio Perdomo, Pedro Ignacio Espaillat, General Jose Antonio Salcedo, Pedro Francisco Bono and Benigno Filomeno de Rojas. Panteón Nacional located on Calle Las Damas. Location: From Calle el Conde turn north onto Calle las Damas. Pass the small Plaza Maria Toledo on the left side of the street. The wall of the Panteón runs along the end of the plaza. Hours: 9 to 4:30 daily except holidays. Entrance is free. Proper dress is required (no shorts, short skirts, tank tops…) and they expect reverence when you enter the building. 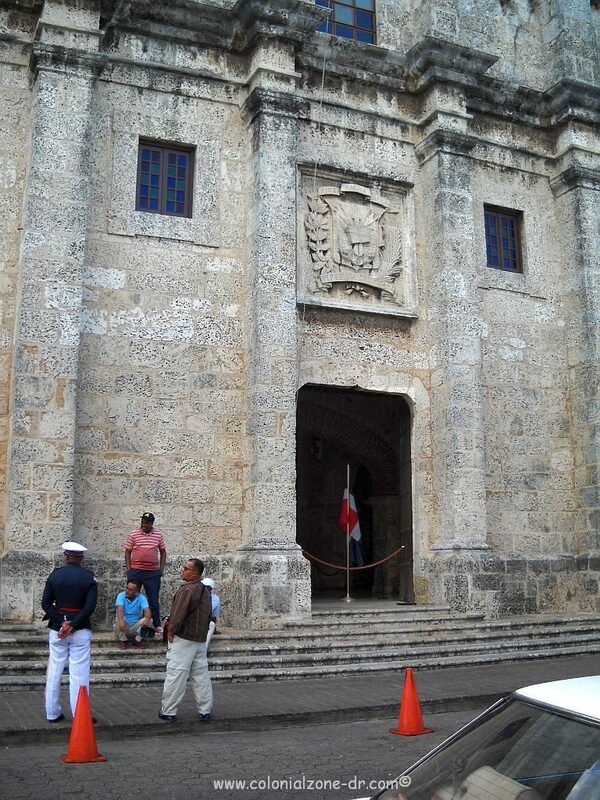 Front of the Panteón Nacional before it opens with the tour guides preparing for their day. Be aware of the tour guides outside the building. 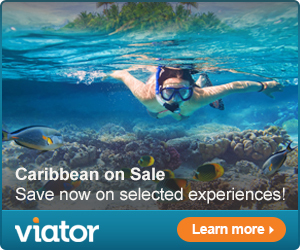 They tell you that it does not cost money to enter. If you do use their guide services they expect to be paid but usually do not tell you that they expect to be paid until after the tour. 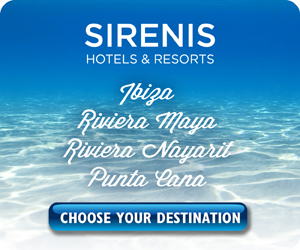 You can enter without a guide but if you do want to use a guide ask about how much he wants paid in advance.